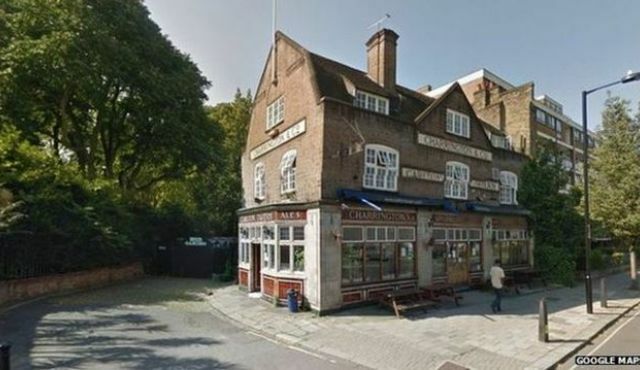 An Israeli property development will be ordered to reconstruct an historic London building that it demolished without permission, according to the London Evening Standard and other media.The company, Tel Aviv-based CLTX Ltd., called in bulldozers earlier this month to demolish the Carlton Tavern, a pub dating back to the early 1920s in Maida Vale, west London. The Westminster City Council, which is responsible for the area, said that it will next week issue an unprecedented enforcement notice requiring the developer to “recreate in facsimile the building as it stood immediately prior to its demolition”. I find it hard not to laugh – they got what they deserved! Robert Davis, deputy leader of Westminster council, said he was “absolutely horrified” at the “scandalous” destruction. The Carlton Tavern was the only building in its street not destroyed during the blitz in World War II and was considered an important historical building. Leave it to Israelis to finish the job. Patsy Lord, the landlady, said she had been told by the owners on Easter Monday to close for an “inventory.” When she came back two days later, she found that the 94-year-old building had been reduced to rubble. Yep, sounds just like them to pull a stunt like that. It will be interesting to see whether they bother to rebuild the structure or just abandon it and write off the loss. My guess is the latter. At least, they didn’t insure the building against multiple terror attacks, destroy it in multiple terror attacks, celebrate a job well done by high-fiving, grinning and hugging each other, collect on the insurance, and exploit the incident as a pretext for war, genocide, apartheid, piracy, torture and imprisonment without trial, etc. Bulldozers is one of Israel’s fortes. The IDF “purchased” fifty Caterpillar D9 bulldozers, but they didn’t pay a shekel towards them; the US taxpayer paid! And the month of that “purchase” ‘coincidentally’ happened to be September 2001, the same month that the Hasbara Fellowships was founded by Rabbi Elliot Mathias in New York City, and the same month as some other significant events. To see my recent trilogy, which debunks the greatest myths of the last 100 years and shows how racist fanatics created the global political climate of today, look up “the protocols of anti-semitism”. Hello, yes, I’m still around. I was working on the latest trilogy for a year, as I wanted to compile the evidence and put it all together. I noticed you’d mentioned this site on the old blog. Things have progressed in some ways over the years; there are a lot of people waking up to what really happened in WWII, for example. On some sites such as Reddit you can post on controversial topics without getting banned. But YouTube is pretty useless for commenting these days. If you provide evidence for your position with longer comments or several short comments within a few minutes of each other, your comment is shadowbanned, whereas the casual reader gets to see the soundbites that have been upvoted by the Hasbara army. When I tried posting at the pro-Zionist urban75 forum, the post was deleted and there was a message, “You have been banned for the following reason: anti-semitic conspiracy crap”. LOL! There was no attempt to counter my statement that most “Jews” are Khazars rather than Semites (as proven in a 2012 study in a peer-reviewed journal by the Jewish Israeli-born molecular geneticist Eran Elhaik), or my statement that the act of Israelis shelling a Gaza beach in 2006, wiping out most of 10-year-old Huda Ghalia’s family and horribly maiming about twenty others, was anti-Semitism in action. There was no attempt to deny the fact that fanatical Jews hate Gentiles, regard them as not fully human, and want to bring about a global despotism where 3-year-old Gentile girls can be raped and executed, and Gentiles can be murdered without any legal consequences, as admitted by the Israeli Yossi Gurvitz in his video “When Israel is Mighty”. There was no attempt to explain away the statements by Jews such as Roger Dommergue, Paul Eisen, David Cole and Joseph G. Burg (Josef Ginsburg) in opposition to the “Holocaust” religion. The public simply get the cherry-picked Zio-friendly ‘information’, where truth-tellers are mocked as “conspiraloons” or “anti-semites”. Funny thing is, the urban75 Brixton metropolitan crowd see themselves as some kind of leftist revolutionaries who are opposed to the existing order. Of course they’ll buy a way to not have to make good with what they wrecked. This is of course how they always work, because its always all about the Chosen Ones.